The NME has publicly apologised to singer Morrissey over an article it published in 2007, which, the singer claimed, suggested he was racist. The former Smiths star sued the magazine, saying it "deliberately twisted" his comments on immigration. 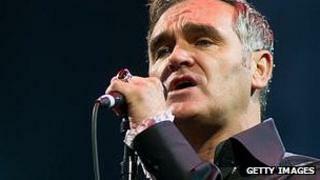 The NME and publisher IPC apologised in a joint statement, adding: "We do not believe [Morrissey] is a racist." An NME spokeswoman said the magazine was "pleased it has buried the hatchet" with the singer. She added the matter of the libel case was now closed and that the settlement did not involve payment of any damages or legal costs. The case had been due to go to trial next month after Morrissey won a pre-trial hearing against former NME editor Conor McNicholas and IPC at the High Court last October. The singer welcomed the verdict, saying he wanted his day in court to "clear my name". The original 2007 article, titled Morrissey: Big Mouth Strikes Again, quoted Morrissey as saying: "Although I don't have anything against people from other countries, the higher the influx into England the more the British identity disappears." He was also quoted as saying: "the gates of England are flooded. The country's been thrown away." In the statement published on its website and in the magazine, the NME said: "We wish to make clear that we do not believe that he is a racist. "We didn't think we were saying he was and we apologise to Morrissey if he or anyone else misunderstood our piece in that way. "We never set out to upset Morrissey and we hope we can both get back to doing what we do best." A statement released by the singer's lawyer said: "My client is obviously pleased that the NME have finally and publicly apologised to him. "This claim was never about financial damages, and no money was sought as part of a settlement. "The NME apology in itself is settlement enough and it closes the case".